"For a number of reasons, universal mobile wallets will not be practical for the next five or six years. This window leaves plenty of time for SMW providers to demonstrate the value of their products to both merchants and consumers. " Every day, more is being said about the potential value in mobile payments. Yet the struggles facing major mobile payment solution providers such as Google and Isis are well documented. How can a product with so much potential be so difficult to launch? These major solution providers are attempting to develop a mobile payment system that can theoretically be available to all consumers, accepted by all merchants, and utilize all major payment networks -an undertaking that will take years to accomplish. Meanwhile, a number of more focused solutions are poised to take advantage of the value of mobile payments today. Rather than aim for universal acceptance, these solutions focus on being accepted by only a single merchant, drastically simplifying the process of implementation. 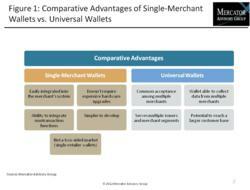 Mercator Advisory Group's new report, Single-Merchant Wallets: Mobile Payments for the Immediate Future, compares single-merchant wallets with universal ones, classifies the two major types of single-merchant mobile wallets, and describes which merchants are in the best position to implement the two types. The report also profiles multiple solutions currently available for consumers and forecasts the growth pattern for single-merchant wallets, with a particular focus on the effect of universal mobile wallet proliferation. "Although universal mobile wallets are expected to become far more common eventually, the current opportunities for mobile payments lie almost entirely with single-merchant wallets," says Dave Kaminsky, analyst in Mercator Advisory Group's Emerging Technologies Service and author of the report. "For a number of reasons, universal mobile wallets will not be practical for the next five or six years. This window leaves plenty of time for SMW providers to demonstrate the value of their products to both merchants and consumers. If they can develop enough loyalty in those groups, it is feasible that they will survive the impact of the bigger wallets and become a factor in mobile payments for the long term." Five-year forecast of total annual transaction volume for single-merchant mobile wallets employed by U.S. This report is 21 pages long with five exhibits. Companies mentioned in the report include: Bank of America, Citi, CorFire, Dinerware, Dunkin Donuts, Facebook, Firethorn Mobile, First Data, Google, Isis, LevelUp, mFoundry, MICROS, PNC, POSitouch, Qualcomm, Revel Systems, SK C&C, Sprint, Square, Starbucks, Virgin Mobile.